Home / entertainment / Jane Iredale vs Bare Minerals: Can You Guess Which One is The Best? Makeup is used as a beauty aid to help build up the self-esteem and confidence of an individual. The importance of cosmetics has increased as many people want to stay young and attractive. Needless to say, you are beautiful whether you choose to wear makeup or not. Don’t feel pressured to wear makeup because other women do. Do not wear it because you think you’re at an age where it’s necessary to start wearing it. Wear it because you want to. Wear it as a form of creativity and expression. Cosmetics can be produced in the organic and hypoallergenic form to meet the demands of users. Today on “Hownwhys” we will talk about two famous brands of makeup, Naah... let me correct; not simple cosmetic makeup but the purest of the pure, mineral makeup. 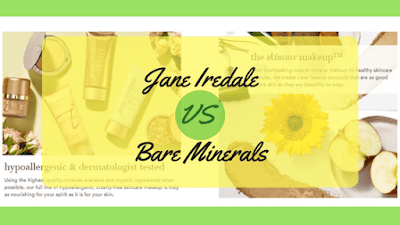 The two brands namely - jane iredale vs bare minerals. Let’s first have an introduction to what mineral makeup actually is. "The whole idea behind mineral makeup is to not use anything known to interrupt the skin's natural function," explains Ruben Potrebenko, makeup artist and national educator for Jane Iredale Mineral Cosmetics. "What makes it so unique," he continues, "is that it's usually free of fillers like talc -- which clogs pores -- and FD&C color -- a known carcinogen." Not only are the minerals lighter and easier to put on, but they also give you a fantastic natural glow. The reason mineral makeup is doing so well is that it makes the skin look fantastic. The minerals actually reflect light off the skin like millions of little mirrors, which make the wearer look flawless. This product is also highly water resistant, so it won't rain off, snow off or cry off, and you can swim in it for up to 80 minutes without it lifting off the surface of the skin. If you haven't already discovered Bare Minerals makeup by now, you have no idea what you've been missing. Since 1976, Bare Escentuals has been revolutionizing the cosmetic industry with its mineral makeup creation call Bare Minerals. Bare Minerals are made from 100% pure, micronized minerals that are free of preservatives, oil, fragrance, talc and other potential irritants. Bare Minerals may look like a powder, but that's as far as the resemblance goes. Bare Minerals SPF15 Foundation feels like a cream and blends flawlessly, giving you the look and feel of bare skin. Their naturally pure Bare Minerals SPF 15 Foundation morphs into your skin to cover imperfections while providing SPF 15 protection. But Bare Minerals goes way beyond foundation. Imagine wearing featherweight, creamy, beautiful color all over your face, cheeks, and eyes. The extensive line of Bare Minerals liner shadows, eyeshadows and glimmers allow you to do just that. Bare Minerals Blush and All-Over Face Colour lend a radiant, healthy glow to your complexion that is as beautiful as it is good for your skin. Bare Minerals buff on so light and smooth that you'll forget you're wearing any makeup at all. Better still, bare Minerals contain no oils or binders-which means their all-natural color stays true all day. Its makeup is so pure, you can sleep in with it. When I talk about mineral makeup, I’m talking about the purest of the pure. For me, that is embodied by the brand that is Jane Iredale. Jane Iredale was a casting director and producer in the US who saw so many young actors having their faces smeared with thick, greasy, congestion-causing stage makeup day in and day out that she decided to provide an alternative. The Jane Iredale brand describes itself as the Skin Care Makeup. The powder foundations come in pressed and loose forms, with an SPF of 20. The Jane Iredale website advertises these foundations with a recommendation from the Skin Care Foundation. Pure Pressed is the line of mineral makeup in the Jane Iredale brand. The Pure Pressed blush comes in warm and cool shades and sells for $30. Pure Pressed eyeshadows come in single colors, duos, triples, and kits of five. Jane Iredale is called The Skin Care Makeup because it is so safe and beneficial to use and is recommended by plastic surgeons and dermatologists throughout the world. Its products also have a broad-spectrum UVB and UVA protection - up to SPF 20, so no additional sunscreen is necessary. As far as I can tell, the products are based on micro minerals and are made without fillers and binders (such as talc and mineral oil) and without chemical dyes or preservatives. Mineral makeup sits ON the pore due to its molecular makeup, rather than IN the pore as cosmetic makeup does. Cosmetic makeup is like wall filler, being slopped into each pore to make them less visible, leading to the creation of congestion. Mineral makeup still reduces the visibility of pores and blemishes without intruding on your skin and disrupting its natural mechanisms of protection. Minerals (for example, zinc, mica, titanium) are not corrosive to the skin, even in their makeup-safe forms of zinc oxide, zinc mica and titanium dioxide. They respect the skin and do not dry it out. It is no secret that powder foundation can be key for those of us trying to get rid of the midday makeup slip and slide. The oil-binding properties of mineral makeup mean that the natural oils your skin produce become a base for your makeup, meaning that it will go on easier and have a glowy finish. Both titanium oxide and zinc oxide, two ingredients commonly found in mineral makeup products, act as a physical block from sun damage. I’m not saying to skip applying SPF altogether, but it is nice to think of it as a safety net to doubly protect you against those rays. Zinc oxide has anti-inflammatory properties and seeing as it is in a much higher dosage than it would be in a cosmetic makeup, it can soothe conditions such as rosacea, eczema and inflammatory acne. Bare Escentuals is a popular cosmetics company that has been helping women look their best since 1976. 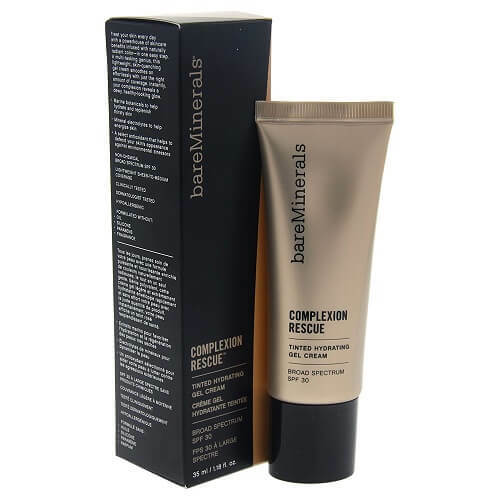 One of the company's largest successes is the development of their exclusive Bare Minerals foundation, which is made without harsh additives and irritants and looks naturally beautiful. Bare Minerals makeup products are sold in themed kits. You can get a Get Started kit for $34 on Amazon. The set comes with a variety of foundation and other all-over powders, as well as brushes, brush cleaners and an instructional DVD. Once you are comfortable with the company and its products, you can invest in eyeshadow and blush kits in different hues. On the other hand, Jane Iredale skin care makeup has been developed as an extension of skin care. The range is so effective that it is recommended by plastic surgeons, dermatologists, and skin care professionals. You can Get Jane Iredale Starter Kit in $56 on Amazon. Four in one foundation, powder, concealer, and sunscreen can disguise almost any skin discoloration. SPF 17 & 20 – gives instant, chemical-free protection, fast weightless coverage. Jane Iredale Mineral Foundations are a bit more expensive, but since the powder is finer, it seems like there is actually more makeup per jar. The blush also comes in a little compact, so less messy. No close comparison at all. Jane Iredale mineral makeup is the winner. With Bare Minerals, you have to purchase the primer, foundation, bisque concealer, and mineral veil. While with Jane Iredale, you purchase the Pure pressed foundations and disappear concealer if you need it. I find the foundation by Jane is enough to cover my acne scars all day!! Plus, Jane is all natural without the irritating bismuth oxychloride! I always felt itching with Bare Minerals! Not with Jane. It has a light feel, but a great even coverage. It also reflects light around wrinkled areas minimizing the wrinkles. Bare Minerals, on the other hand, accentuated wrinkles and pores and sets on the face very unevenly. Though pricier, if you want a better product, I would choose Jane Iredale. Beauty starts from within - it's a cliche but it's true. If you feel healthy and happy you will naturally exude more confidence and charisma. Your skin is more likely to glow and you are more likely to exert energy and the secret to beauty ... you are more likely to SMILE. Don't forget to share your experiences with both of them in the comments section below.